Discover some of Namibia's cultural and natural wonders on a 3-day tour from Windhoek. 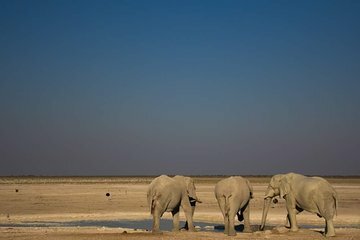 Begin your multiple-day adventure with a visit to Etosha National Park, home to an abundance of wildlife such as lion, rhino, elephant and leopard. Enjoy multiple safaris and a visit to the park's massive salt pan—a breeding ground for flamingos—before continuing onto Swakopmund via Damaraland's stunningly rugged landscapes. Along the way stop for lunch in the shadow of towering Brandberg Mountain, mingle with impeccably dressed Hereo ladies and experience the aptly named Skeleton Coast. You will arrive in Swakopmund between 4pm-5pm. Please ensure that you make your own accommodation arrangements for this night as there is no option for onward travel from Swakopmund on this day.